For teachers, this guide provides a common language of writing instruction and discourse to use when students submit essays online. 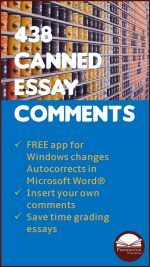 The Pennington Manual of Style enables teachers to download the entire comment bank of 438 Essay e-Comments into the Autocorrect function of Microsoft Word®. Then, teachers type in the assigned alphanumeric code and the entire formatted writing comment appears in a comment bubble where desired on the student’s essay. Teachers can save time, yet do a more thorough job of essay response. The Pennington Manual of Style is included in the comprehensive Teaching Essay Strategies program. Purchase includes the download (into Microsoft Word for any Windows Version) and the teacher short-cuts.